The Fostex 6301 Series Personal Monitor has a nice sized design that fits almost in any corner. I have been using these spiffy speakers at work for a few years now and they still sound quite good. 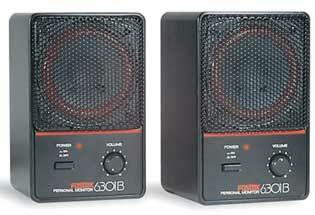 In fact they sound better than some of the other so called “more powerful” speakers in their class. I will admit that it only has a power button and volume control knob but it still does the job. It is perfect for computer systems and even component sets that need to be taken from place to place. Simple, easy to carry, what more can I say? !